Mercedes confirmed their dominant performance from FP2 and FP3 and made it a 1-2 in qualifying for the Russian Grand Prix. This time, it was Bottas who took the honours for pole position, thanks to mistakes by Hamilton when it mattered. Sebastian Vettel was third fastest, but no match for the Mercedes drivers. Qualifying kicked off with everybody opting for the hypersoft tyres, the quickest compound available at Sochi. After Williams, lots of drivers were rapidly out out track to set a benchmark time. Ferrari were also out in the first pack while Mercedes waited for a few more minutes. Once they were out however, the Mercedes immediately seemed quickest, with Bottas immediately topping the times with his first flying lap. Hamilton on the other hand seemed set to do so as well, but he made a mistake in S3 and ended up 11th with his first run. Ferrari and Mercedes opted to have their cars run 2 flying laps on the same set of hypersofts, with one cool-down lap in between. That allowed Hamilton to easily stick to his plan, go fastest with a 1:32.825 on his second attempt and then return to the pits, sure of making it through to Q2. Still, as if he just couldn't get enough, he added another cool down and hot lap after that, shaving another 3 tenths off his previous best. At about the same time, both Red Bulls finally started their first flying laps, even though certain of starting near the back of the grid thanks to engine and gearbox penalties. Ricciardo and Verstappen went third and fourth fastest on their first attempts. Towards the end, Sirotkin ruined a few flying laps as he caused a brief yellow flag situation by spinning off, but it didn't matter all that much, as Hartley joined Williams and McLaren as being eliminated at the end of Q1. Q2 saw Ferrari and Mercedes opt for the ultra soft tyres, All four drivers set quick laps early on and seemed sure of a position in Q3, but all still opted to go out again on the hypersofts towards the end of the session. Such tactics aren't new, and likely only to allow drivers to get back into the feel of the hyper softs before it really matters in Q3. Hamilton and Bottas still completed their hot laps, but slowed down considerably in the final corner to avoid improving their earlier times. Ferrari meanwhile called their drivers in before that, emulating the same result. Behind them, Leclerc set the 5th fastest time, removing any doubt that his set-up struggles from Friday were resolved. Still, getting through wasn't really difficult as all 5 cars out of Q2 simply didn't run due to the starting grid penalties they faced. This meant that along with Mercedes and Ferrari, Q3 was to be run with two Force Indias, two Haas and two Sauber cars. In Q3, Ocon was the first to start his flying lap, followed by Bottas, Hamilton, Raikkonen and Perez. As the cars crossed the line after their first laps, it was more than clear that Mercedes effectively had a considerable advantage. Bottas ended up fastest, with Hamilton second at 0.004s, due to losing three tenths through the second sector. Both Ferraris were around 6 to 7 tenths behind, while Ocon, 5th fastest after his first run, was nearly 2 seconds behind. 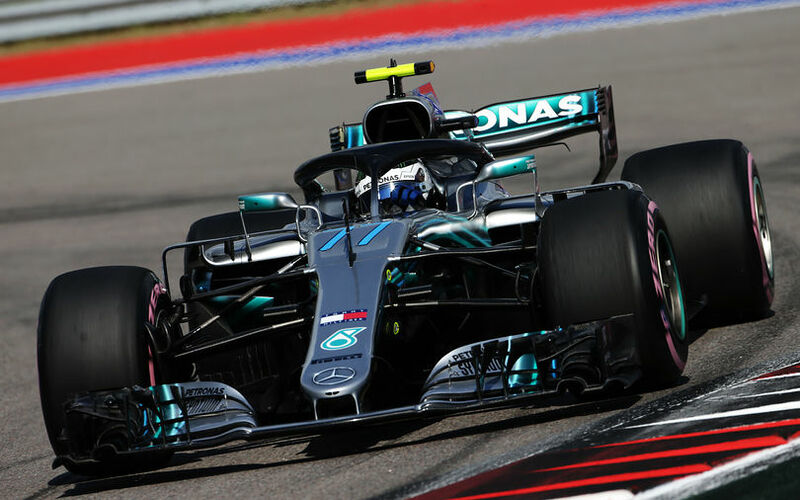 The second runs saw a similar situation, with Hamilton easily fastest in S1, but an error in S2 saw him lose a full second to his team mate, sealing pole position for Valtteri Bottas.